Just to announce the second annual "School of the Renaissance Soldier: Actions of the Lowe Countries" to be held near Sacramento, California March 31-April 2, 2006. This shall be an in-depth, in period event consisting of both Horse and Foote, following the drill manuals of the 16th and 17th Centuries. The Foote shall primarily be following William Barriffe's Military Discipline: or the Young Artillery-Man, Mars his Triumph, (an exellent website devoted to this, by our Corporal of Pikes Barry Siler, may be found here: http://syler.com/drillDemo/menu.html ) while Horse shall primarily follow John Cruso's Militarie Exercises for the Cavall'rie (1632). With the new addition to the family, its not going to happen for me this year. I've been talking to my guys though and we're already setting money aside for next years road trip. Just make sure you do another one of these Gordon! And pictures and after action reports are demanded by the Bristol Bandes! No worries, we've given ourselves a minimum of three of these to do... after that, they'll probably just sort of run themselves, LOL! I have folks planning on coming out from the East Coast for '07, and a contingent of Brits for '08 (they want to hit Jamestown in '07, so I can understand that choice, as I plan to also! ), thus it looks like I'm in for doing these through at least '08. Oh what a problem, right? I anticipate a professional photographer's presence this year (he's one of our Germans) so we ought to have some top-notch photo's this time, though I'll admit to being pretty pleased with the one's from last year, too. But the more photo's, the better. So I hope to see you and your Bristol Boys in '07. I'll hold you to it, LOL! Just wanted to wish you and all your folks luck and good times this weekend Gordon! I've already started putting money away in the travel fund for next year's event. Looking forward to all the pictures and after action reports! Thanks Chris! We're working on the last minute details right now,. I'm packing my kit, getting the horses ready, and steeling myself for the two-day drive down to Sacramento pulling the horse trailer. Wehad to go through a change of site, adding on/subtracting various venues, deal-making galore, but now we're in the home stretch, and things look good. 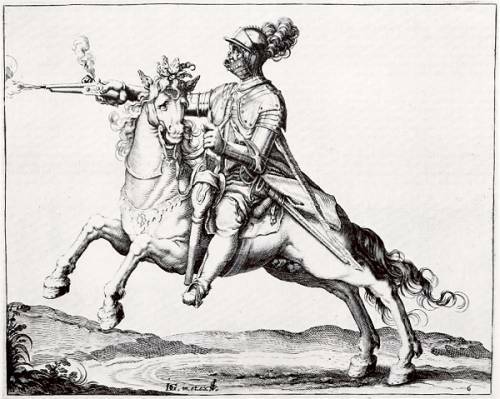 On the plus side, we ought to have upwards of half-a-dozen Harquebusiers, a dozen Gendarmes/Pistoliers, half a dozen Border Horse, along with 30+ Pikes and perhaps 20 Arquebusiers/Musketeers! I think the results will be well worth all of the funds and efforts put into the event, and I'm really looking forward to it. I know that not all of the material culture that people will be brining to this event will be stellar, there's still a lot of "Ren-Faire" look going on out there (and since there is hardly anyone who is already doing Renaissance Period Horse stuff, it will be kind of catch-as-catch-can in so far as equipment and weaponry goes too), but you have to start somewhere. This is it. Thanks for your well wishing, and I will be sure to post LOTS of cool pictures when I get them. I'm really looking forward to making you fellows jealous, and beating yourselves up for not being there! I'll also have a report to make on the arm-harness that Allan Senefelder of Mercenary's Tailor (and who posts regularly here) made up for me in fine 16th Century fashion. Gads, they look great! Now we'll see if I can sit a horse in them, LOL! Well, we survived! Though it rained to beat the band throughout much of the week, and even on Friday afternoon, we managed to have great weather for Saturday and Sunday. We had 86 participants this year, up from 60 last year, but the real shocker for me was that we had 20 Horse! Not too shabby for a hobby that hasn't gotten in to Cavalry for this time period yet! We had several folks up from San Diego and and LA, while 10 of us made the journey from the Seattle area (with 6 horses, no less!) for the event. I count it a great success! Here are a couple of photo's from the event. Please pardon my focus on the Cavalry aspect, those are the pictures I've gotten so far. WOW ! Some huge looking guys on HUGER looking horse ! Nice armour and muzzle loaders and costumes. There could be a few feature articles material here ...... Hint Hint. Yup, we had more than a few BIG horses at this event. When my own big boy isn't the biggest, you know that there's a lot of meat on the hoof! I think we had 6 (at least) Draft or Half-Draft horses present. 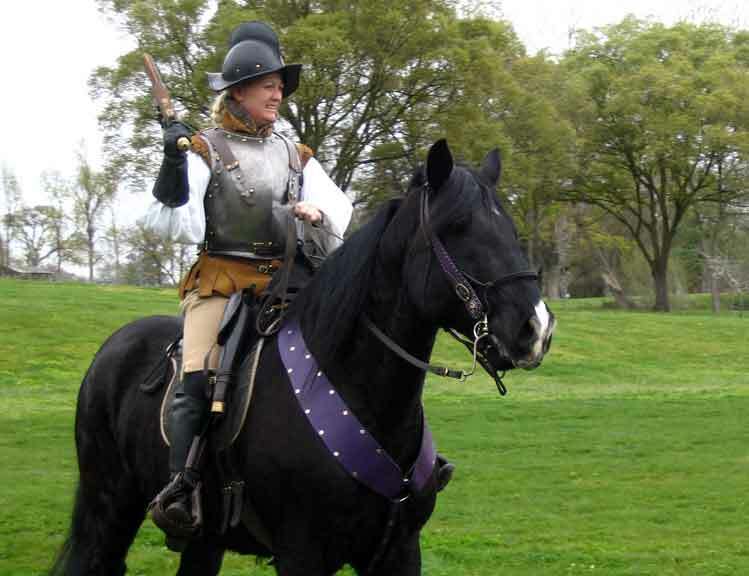 The big Drafties aren't actually proper for a period Heavy Horse mount, but they are what are popular (or have been) on the Jousting circuit for the past many years, and thus what many of the folks who are interested in Renaissance-era Cavalry own. So we make do. It was pretty well jazzed too at having so many folks in armour too, or at least some armour. Only two in cap-a-pie, but several in half suits (including myself) and more in corselets. It was pretty nifty. We practiced some "en haye" charges with the Lance, charging a line of quintains set up for the purpose and trying to hit them all at the same time along the line. Difficult thing to do, it was discovered. 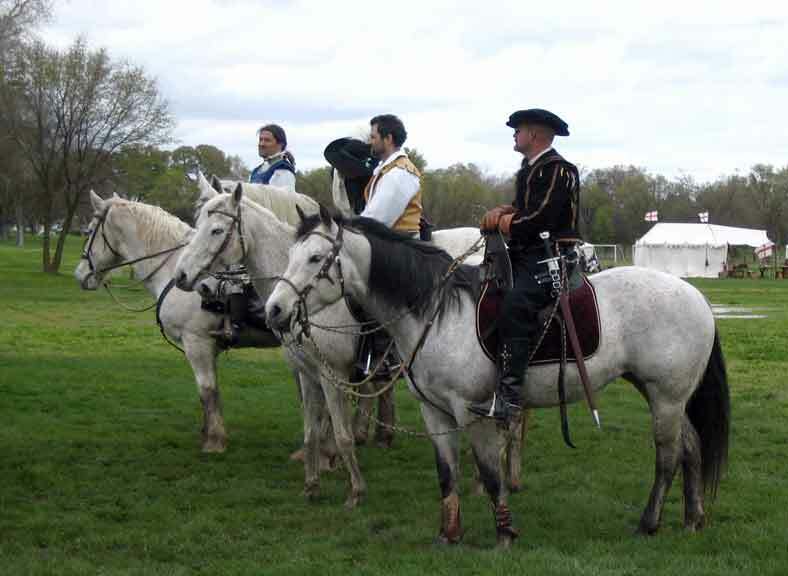 What was also fun was that I managed to scrounge together a dozen pistols and carbines for the event (MOST of them period to prior to 1650 at least), so we were able to practice (and try to discover some of the tricks to) the Caracole as practiced by Pistolier Cavalry during that period. We didn't have time to actually do any real gunfire desensitization with the horses though, so although we received fire from the Foote, we did not actually give fire ourselves. That takes more than a mere weekend to put together, I'm afraid. But the Foote was kind enough to let us practice on them, even taking "hits" from us, which was quite gratifying I must say! But suffice it to say that we had fun, learned something, and managed to enjoy a great deal of cameraderie through the weekend. I look forward to doing it bigger and better next year! This is so COOL! I wish I had time to do stuff like this. My favorite time period to boot. More pics Gordon. Gordon, that is slick! I must say the arms do look mighty nice with the rest of the kit. I am soooo pushing for my boys to make a field trip for next year. Hell, I'll even donate my wheellock pistol and doglock carbine to cavalry if I'm coming. As long as I get to be there to feel the charge of over 20 horses. I've always wanted to have a pike in hand and feel the ground move. B ut then again, I'm a huge geek. Hey Gordon, looks like from everything I have read (mostly on the IJA forums) that it was great event. I am sorry that I could not attend, but work has to come before play. Cheers to everyone who participated. Chris, I'll take you up on that offer! One more wheellock pistol, and another good carbine will be more than welcome! (As you may have noticed, I "cheated" by issuing out a Brown Bess Carbine to one of the fellows, since we were so shy of proper firearms. It's pretty much right for 1686, but.... It'll have to do for now!) So I very much hope that your fellows can join us next year, and hopefully we won't have QUITE so much rain to make the ambiance oh so much like the Netherlands! Lloyd, you have no idea how much fun Clif and Rainman were having! Grinning from ear to ear most of the weekend! And in some shots you can see Jules with him on Brittney, too. What a team! She (Jules) took to it like a duck to water, and I suspect that there's going to be a strong push in their camp towards doing more of this! And yes, I'm certainly going to encourage folks to work on pistol training their mounts for next year. Although we got to practice the Caracole against the Foote, it will be MUCH cooler to do it while firing off pistols, no question! I know I'll be working on my own horses, for although they are somewhat desensitized to it, I'd much rather they be REALLY blaze' about the whole thing. Anyway, I'm tickled that we got as far as we did with totally green horses and riders (green to what we were doing, most of them were quite experienced in other aspects of horsemanship already). What no artillery? Really looks like a hell of alot of fun! Some day before I expire i'll have time ot do this sort of thing. Hopefully if things work out, we'll be able to fix that for next year. Gordon, do you have ideas of dates for next year? Its already the fourth day after the last event, surely you have things planned for the next one. We were SUPPOSED to have some artillery there: my friend Dale Shinn, who makes the wheellocks and matchlocks and such, made himself up a Swedish Leather Gun that he brings to reenactments, but the bugger skipped out on us and took a cheap flight to Scotland to do some research instead. Such ingratitude! But what the heck, one less thing for the ponies to have to get used to! Chris: Per next year's dates, gads, I haven't even begun to recover from this year! And Thankfully I'm not going to be Muster Master AND Rittmeister next time, that's my compadre Patrick Gaul's problem, being Muster Master. Actually, with the site change and such, he did a huge amount of work this year, so he's well versed in the issues. But he gets to choose the dates, so we'll see where it goes from here. But I'm game to see just how many Horse I can muster up for this next one! I'm hoping for 32-36! Thank you, Drake, I'll try to get some more up soon. For now, here's a fun one for you. My Front Rank, of grey horses. I can't believe you had that many horse. Oh, there was some Foote there, too... gotta have a target-rich environment!